Three Lions got the nod in Round 2's Team of the Week. Daniel Rich is ready to turn heads again in 2019, says Captain Dayne Zorko. The Lions are conceding a staggering 40 points less each game than they were two seasons ago. Daniel Rich is a high possession-winning in-and-under midfielder/defender with a penetrating left foot and quality skills. 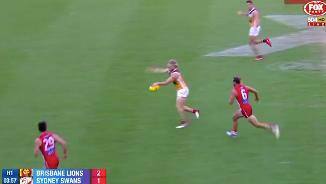 The high-profile West Australian recruit received the AFL Rising Star Award in his debut season with the Lions and is now widely regarded as one of the most damaging players in the AFL competition. After starting his career predominately in the midfield, Rich moved to more of a halfback role in 2017 and impressed with his vision and run out of defence. • West Australian Daniel Rich was an accomplished junior footballer who achieved plenty before even reaching the AFL ranks. • He joined WAFL side Subiaco in 2007 and played senior football in his first season. • He graduates from the esteemed AIS/AFL Academy and represented Western Australia in the 2007 U18 national championships and earned All-Australian honours. • He starred in Subiaco’s 2007 finals campaign including their Grand Final win over Claremont which catapulted him to one of the most talked about teenage prospects in the country. • During his final year as a junior, Rich showed his leadership potential by captaining Western Australia in the U18 championships and earned All-Australian honours for the second consecutive season. • He was also a key part of Subiaco’s back-to-back premiership winning team. Remarkably, Rich had featured in two senior WAFL premierships before even being drafted to the AFL. • Rich was lauded as an almost certain top three selection pre-draft and had even been tipped to be the first player chosen in November’s selection meeting. • He was unable to participate in much of the Draft Camp testing due to a sore hamstring sustained in the WAFL Grand Final, but still managed to impressive the club recruiters. • He proved the 2009 National Draft’s big slider, falling to Pick No.7 where the Lions had no hesitation in reading out the highly credentialed West Australian’s name with the Club’s first selection. • Rich played every game in 2017 and averaged 21 disposals and just under four marks a game. • Finished the season as one of the Lions' best players. • Kicked eight goals for the season. • Daniel Rich averaged 19.6 disposals in 2016 with his best game of the season came in Round 1 against the West Coast Eagles in Perth. • Fresh off a four-year contract extension, Rich opened the season with 23 disposals, 11 tackles and kicked two goals in a team best performance. • As the season progressed he struggled with consistency in his game, often struggling to break a tag. • After an ACL injury ruined his 2014 season, Daniel Rich was out to impress in 2015. • As an integral part of the team’s defence group, he demonstrated moments of great skill and flair, but also struggled with consistency across the 21 games he played for the season. • In his return game in Round One, Rich booted two goals and had 29 possessions in the Lions’ 12-point loss to the Pies. • Under new Senior Coach Justin Leppitsch, Rich was trialled across half-back throughout the 2014 pre-season, where his booming left foot and precise skills proved a weapon. • In Round 2 he and fellow 2008 draftee Jack Redden both ran out for their 100th AFL game against Geelong at the Gabba. Rich finished with 20 possessions (15 contested) in a narrow loss to the finals-bound Cats. • Tragedy struck the following week, when Rich injured his knee early in the Lions' Round 3 clash against Gold Coast at Metricon Stadium. 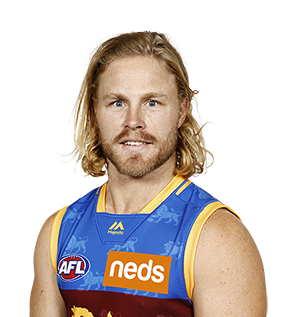 Scans later confirmed that he had ruptured his ACL and would require a full knee reconstruction. If there was any good news, it was that there were no further complications with the knee, meaning he would be back in time to start 2015 pre-season training in 9-10 months' time. • While sidelined, Rich took the opportunity to get more involved off the field, and even spent time in the coaches' box with the Lions Reserves side in the NEAFL. • Fresh from finishing Runner-Up in the 2012 Club Champion award, Rich started the season like a house on fire, dominating throughout the Lions' NAB Cup campaign, and winning the Michael Tuck Medal as the team's best player in their pre-season Grand Final victory over Carlton. • The hype surrounding Rich even saw him appear in Mike Sheahan's prestigious 'Top 50' at the beginning of the season. • Aside from a dominant QClash performance in Round 3, his first month was relatively quiet before disaster struck at training on the eve of Round 5 when he broke his scapula (shoulder blade). The injury would keep him sidelined for the next five matches. • He returned in Round 12 - after the team's Bye - and went on to play in each of the team's final 12 matches. • He resumed his role as one of the Lions' most dangerous weapons in the midfield, and even booted eight goals during a purple patch between Rounds 19 - 22. • Rich averaged 18.5 disposals across his 16 senior matches - his lowest return since his debut season - but still ranked second at the Club overall in total Inside 50s and Goal Assists. • Having missed more than a quarter of the season ultimately cost Rich on Club Champion night, as he shared =12th position with Jonathan Brown. • After a standout pre-season, Rich produced his best AFL season to date in 2012, averaging 21.7 disposals per game and ranking third on the Club’s goal-kicking list with 20. • Rich’s improved fitness helped him cope better with opposition tags, which enabled him to collect 20 or more disposals in all but four of his 20 senior matches. • He was sidelined during Rounds 17 and 18 while serving a two-match suspension after being found guilty of ‘rough play’ against St Kilda’s Clinton Jones in Round 16. • He continued his recent good form against the Gold Coast in Round 4, with 22 disposals, eight tackles and three goals in QClash3. • But he saved his best performance for last – collecting 25 disposals, 11 inside 50s and booting four goals in the team’s season finale against the Western Bulldogs at the Gabba. It was arguably his best individual game in Lions colours. • His excellence and consistency saw him finish Runner-Up in the Lions’ Club Champion award – just two votes behind eventual winner Joel Patfull. Some argue that his undisciplined act earlier in the season might have ended up costing him a maiden Merrett-Murray Medal. • Rich was also recognised by the umpires – finishing with the equal most Brownlow Medal votes of any Lions player with a personal-best 8. • After starring in the Club's 2011 pre-season campaign, Rich assumed his position as one of the team's key midfielders and continued to receive plenty of attention from the opposition. • He went on to play a critical role in each of the team's first 13 matches including a dominant performance against SUNS in Round 7 where he kicked three first-half goals and collected 26 possessions in the Lions' narrow loss in QClash 1. • Midway through the season he started to notice some discomfort in his foot, but continued to play through the pain until it was determined after Round 14 that he needed a stint on the sidelines. • The stress reaction in his foot kept Rich out of action for six matches. It was a bitter blow for the durable young gun who had previously played 57 consecutive matches since his senior debut. • Rich made a welcome return in Round 22 against reigning premiers Collingwood at the MCG, collecting 13 disposals in just over a quarter of football after starting as the substitute. • He was then among the Lions' best the following week against the Eagles when he gathered a season-high 27 touches and nine tackles in the team's narrow loss at the Gabba. • He finished with a total of 16 senior matches in 2011 and averaged 19.2 disposals per game (just 0.2 short of his personal best). • Rich also put rest to the rumours that hinted at his potential return to WA, by re-signing with the Club for a further two seasons. • Following a stellar first season in 2009 which saw him win the AFL Rising Star award among other honours, Rich added bulk to his frame over the 2010 pre-season and established himself as a key component of the Lions midfield in 2010. • While Rich was consistently among the Lions top performers in the midfield, he particularly shone in the half-back line towards the tail-end of the season in the Lions’ narrow loss to St Kilda in round 15, against Melbourne in round 18, and Essendon in round 21. • Rich led the Lions in inside 50s (93) and was second for tackles with 103, and had an impressive average of 19 disposals per game. • Rich has not missed a senior AFL game since his debut in round 1 of the 2009 season, playing all 22 games in 2010 and bringing his total AFL games to 46 in just two years. • He finished inside the top ten at the Club Champion Award, at eighth place with 24.5 votes. • The West Australian teenager didn't put a foot wrong in his first pre-season with the Lions and was rewarded with selection in the Club's season opener against West Coast (the team he had previously supported) at the Gabba. • Rich had the football world talking after he collected 21 disposals and had eight inside 50s in his first match. The performance earned him the first AFL Rising Star Nomination for the 2009 season and he was immediately intilled as the favourite to take out the award. • Rich became a regular contributor to the senior side. His hard-tackling and ball-winning ability were features of his game while his penetrating left foot regularly found targets inside the Lions' attacking zones. • He collected a season-high 32 disposals against eventual premiers Geelong in Round 15 at the Gabba which further cemented his status as the game's best young player. • He starred in his first trip back to Subiaco Oval in Round 16, collecting 31 disposals and kicking a 60m goal in the wet against Fremantle. • He played all 24 senior matches in 2009 - including two Finals - and averaged an impressive 17.3 disposals per match. He also kicked 14 goals during the season which ranked him fifth overall at the Club. • He became only the second person in history to be unanimously voted as the AFL Rising Star - receiving top votes from all nine judges. He became only the third person in Club history to take home the prestigious award. • Rich received further accolades at the AFLPA Awards when he blitzed the field to take home the Best First Year Player Award. • Not surprisingly, he won the Lions' Rookie of the Year award and also finished 6th overall in the Merrett-Murray Medal - the highest ever placing of a first year Brisbane Lions player.